Steel doors are impressive due to the excellent structural properties of the material. 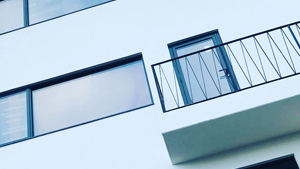 They are particularly suitable for door constructions at entrances and in partition walls, where high demands are made with regard to load-bearing capacity and security. The Janisol® and Economy® steel door systems from Schuco Jansen Steel Systems offer expanded design freedom both outside and inside. 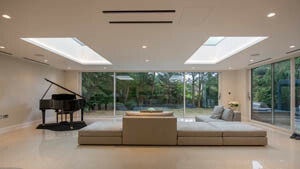 With small frame ratios and large glass areas, they fulfil important architectural requirements with respect to visual elegance and transparency. 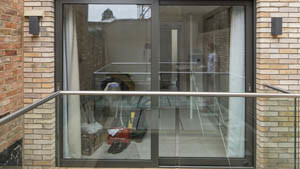 Bi Fold Door Factory The obvious choice for steel profile doors. Because of their superior structural properties, Jansen tubular steel profiles are an ideal construction component for large-area folding doors. The profile system (basic depth 50, 60 and 80 mm) fulfils the highest functional and aesthetic requirements for automatic or manually operated door systems. The non-insulated Jansen tubular steel profiles (basic depth 50 and 60 mm) are an ideal construction component for sliding doors: the superior structural properties of the material means the profiles can be very slender. 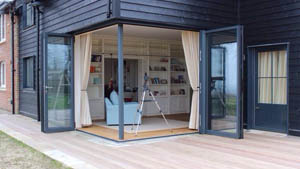 This means that even large, heavy duty sliding doors can have an elegant appearance. The range of fittings for Jansen sliding doors, which has been specially tested for this system, ensures that the doors are secure with quiet and easy operation, even for large door systems. This makes them ideal for use in multi-purpose buildings, warehouses, garages and in industrial buildings. 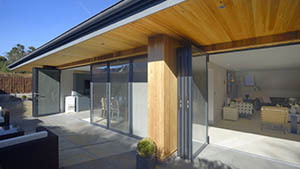 This profile system is also ideally suited to the construction of sliding and folding / sliding doors. Launched at BAU earlier this year, the VISS Fa§ade Door is unique to Schueco Jansen and demonstrates the system innovation and engineering expertise that have made the company Europe’s leading steel systems specialist. Available in a single or double-leaf configuration in a variety of sizes up to a maximum height of 6 metres, the door is designed as a specific project solution based on a mullion/transom construction. A VISS Fa§ade Door enables items to be moved easily from one side of a fa§ade to the other, making it ideal as a service door for locations like exhibition halls, atria, car showrooms, museums etc. The special design principle means that the bimetallic effect often encountered with very large doors exposed to strong sunlight is not critical, so ensuring a trouble-free working life. 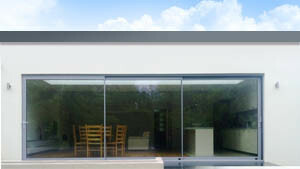 Virtually identical in appearance to the steel fa§ades in which they are set, VISS Fa§ade Doors have thermally insulated frames and can accommodate glazing units up to 42mm thick to minimise heat loss. Double rebate gaskets are standard and locking consists of concealed espagnolette bolts to the bottom and top of the door. The doors are inward-opening and are operated only from the inside. 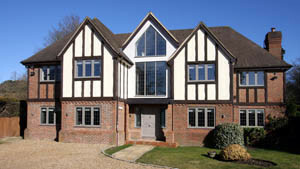 The VISS Fa§ade Door is part of a comprehensive range of highly engineered steel windows, doors and fa§ades, including fire protection versions, from Schueco Jansen. 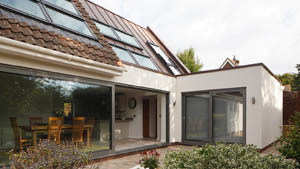 The slimline, thermally insulated profile system in stainless steel is an elegant, highly resilient addition to the tried-and-tested Janisol range. The stainless steel series can be used to design highly attractive single and double-leaf door constructions for use inside and outside. The Janisol® stainless steel profile system is available in the same face widths as other flush-fitted Jansen door systems, thereby offering flexible design options. Particular visual emphasis can be added with a choice of sheet metal or highly polished profile surface finishes. The acid-resistant stainless steel profiles (quality 1.4401) are particularly suitable for use in coastal areas, in industrial areas, near exposed roads and in areas with strict hygiene requirements. 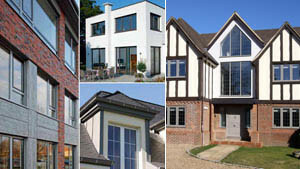 The multi-purpose Jansen Economy® 50 steel profile system (basic depth 50 mm) is ideally suited to elegant single and double-leaf doors, and fixed glazing. What makes this door construction particularly attractive is its flush appearance and the all-round shadow joints inside and outside. The Jansen Economy® 50 non-insulated door system has the same appearance as the thermally insulated, flush-fitted Janisol® doors. This ensures uniform appearances for different planning requirements.